Halogen Ovens - What Are They? Are you aware of halogen ovens and how they work? They can save you space, time,energy and money - and they're easy to use. It would be easy to dismiss halogen ovens as a gimmicky gadget - the type of thing that you might use once or twice, but which would then languish, unused and unloved, in a cupboard somewhere. That would be a mistake, however. Halogen ovens use halogen, infrared heating and convection to cook food rapidly and evenly. They can cut your energy usage, save you space and save you money. They're also very easy to use and clean. Like many people, my first introduction to halogen ovens was via the TV shopping channels. If I'm honest, I pretty much dismissed them without too much thought. A lot of the gadgets that you see on these TV channels tend to sound like a good idea but prove impractical in daily use. It wasn't until my sister-in-law actually got one and shared her experience that I realized I had made a mistake in writing these ovens off. They offer all sorts of benefits to the user, and they're really easy to use and to keep clean (much easier than a conventional oven). Many of them have a "self cleaning" mode in fact. Like many of the most successful innovations, halogen ovens are, when all's said and done, rather simple. They consist of a large glass bowl, into which the food to be cooked is placed, and a cover for the bowl. The cover has a halogen light bulb, and sometimes some infrared elements also, and a fan. The halogen light bulb heats the air to a high temperature very rapidly and the fan circulates the heated air around the food to be cooked to ensure that it cooks quickly and evenly. 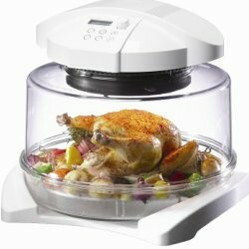 You can put a whole meal into a halogen oven at one go. For example, you can roast a chicken and cook all of the vegetables at the same time. The high temperature seals the flavors inside the food, so there's no flavor leakage from one item to the other. It's really convenient. Halogen ovens heat up extremely quickly and the convection element means that food cooks very rapidly indeed. What you get is food that tastes like it's been roasted in an oven - but in almost as short a period of time as if you had cooked it in a microwave. It's the best of both worlds really. 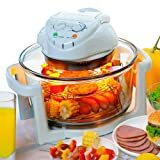 To cut a long story short, you can cook anything in a halogen oven that you would normally cook in a conventional oven. However, it cooks a lot faster (close to microwave cooking times) and it uses a lot less energy. Here's a list of some of the main benefits - and check out the video below for a visual demonstration. Very rapid cooking due to halogen, infrared and convection heating. Keep an eye on your food as it cooks - no need to open the oven door and let the heat out. Uses less energy than a conventional oven - up to a 75% reduction. Roast, bake, boil, broil, steam and fry. Cook anything that you would in a conventional oven. Very easy to clean - most models have "self cleaning" functions. Healthy eating - no need to add oil or fat. Cook an entire meal in a single container. Fits easily on your kitchen counter. Takes up about the same space as a microwave oven. I bought myself a halogen oven before Xmas. I absolutely love it! It's like something from a 1950s space movie! Also, saves electricity so good for the environment. I'm a believer! Shared this on Pinterest. Great product! 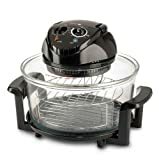 I have halogen oven and it is great addition to the kitchen. Thanks to shorter cooking or baking times it is also healthier choice to conventional oven. As a long time user I can honestly say it has only one disadvantage - we should be aware of its dimensions. Shorter preparation time is in large part consequence of its small volume and round shape (so the fan can make the most of the available heat). So we should know baking tray has to be shorter than in conventional ovens (I have round one) and the portions are not as large as we may be used. Knowing these limitations I can only add - it's probably best gadget I have seen in commercials. Kindle Paperwhite or Nook Glowlight? Which is best - the new Kindle Paperwhite or the Nook Simple Touch With Glowlight? Choosing a gift for a whisky lover is easy - a bottle of single malt will always be welcome. However, there are plenty of other whisky related gifts available.